I am always looking for good recipes to showcase our olive oil. However, Sean found this great recipe on the Wild Yeast blog and I wrote to Susan to ask for her permission to repost her recipe here. She kindly agreed. Thanks, Susan. Oh my goodness. 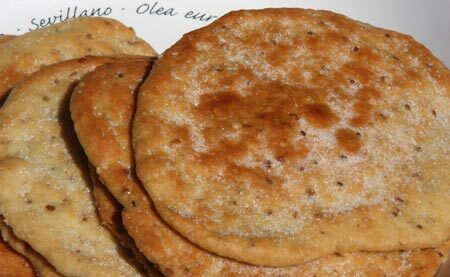 When my daughter went to Sevilla, Spain two summers ago, she brought back some tortas de aceite, the crisp, lightly sweet olive oil wafers traditionally made there, and I was in love. Imagine my delight when, paging through Penelope Casas’ excellent La Cocina de Mama: The Great Home Cooking of Spain, I found a recipe for tortas de aceite that calls for leftover bread or pizza dough. I had that leftover dough! And in short order, I had those tortas. I was in love all over again. I made these a few times and discovered that either pizza dough (made with a bit of olive oil; my dough was left over from making grissini), or a basic French bread dough (no oil), can be used. I refrigerated the dough after the first fermentation and kept it a day or two before making the tortas. I also found that incorporating the generous amount of olive oil into already-developed dough was neat and quick with a food processor, whereas by hand it was a bit messy, though certainly doable. Take your pick. If the dough has been refrigerated, remove it from the refrigerator. In a small skillet over medium-high heat, toast the sesame and anise seeds until they are fragrant and the sesame seeds start to pop. Optional step: Transfer the seeds to a mini-processor or mortar and pestle and grind them a bit (they should not be be completely ground up). In a small skillet, heat the olive oil and lemon zest over high heat until the peel is black. Remove the zest and cool the oil. Place the dough, seeds, olive oil, and anise liqueur in the bowl of a food processor. 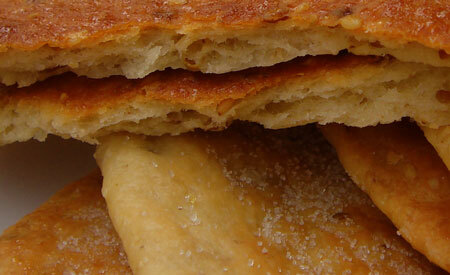 Pulse until the oil is evenly distributed through the dough (but it will not really be incorporated into the dough). Add the flour and pulse until a homogeneous ball of dough forms. It will feel very soft and oily. Turn the dough onto an unfloured counter and divide it into 8 balls (about 30 g each). Roll each ball into a 4-inch round (initially roll them a little larger to allow for some spring-back). 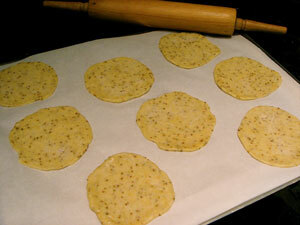 Place the rounds onto a parchment-lined baking sheet and sprinkle them lightly with sugar. Bake for 15 – 17 minutes until the wafers are lightly brown. Enjoy these with morning coffee, or any time. If by some miracle they’re not all gone within a few hours, you can wrap the wafers individually in waxed paper. But I’ve not been able to keep them around long enough to tell you how long they will last that way. This entry was posted in Blog, recipes on November 22, 2007 by ameliaoil.